Student Details provides you with comprehensive information for individual students. You can view the Details page for any student at the school, not just those you teach. 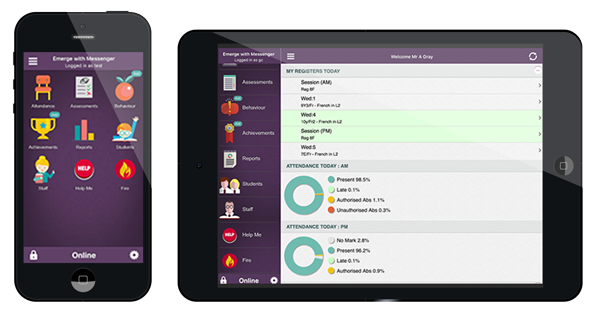 1) To access this area from your Emerge Mobile account, tap Students from your Dashboard. 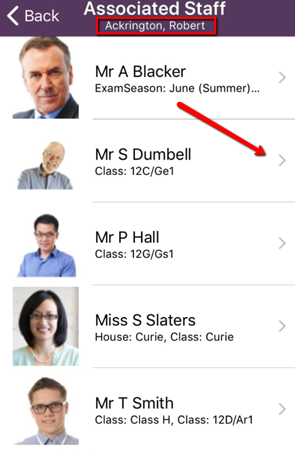 2) If you are linked to classes they will be displayed at the top of the Students Tap on the class you wish to view. a. Once you are viewing your class, either use the search bar at the top or scroll down the list, then tap on the student you need to view. Once you have located a student, you will be able to able to view information such as Attendance Summary, Contact Info, Assessment Results and Medical Info. From the top of the page, you will see summary information regarding the student including any Flags (e.g. FSM, G&T) and Home Language if this information is stored in your MIS. The doughnut chart uses a colour key, and allows you to view a breakdown of a student’s attendance for the year so far. From each student’s details page, you can also view other important information. 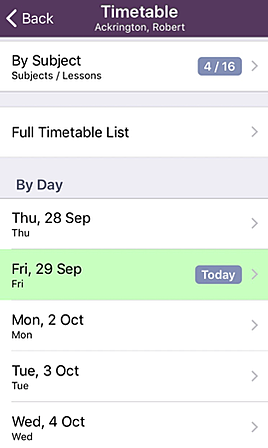 View a student’s weekly (5 day view) timetable by Subject, Day or in Full. By Subject: Lessons for the week are organised by subject. Full Timetable List: View a full list of lessons for the next 5 days. By Day: Each day will display lessons in the relevant timeslots. Home Address, Parental contacts & Siblings. Tap on a parental contact to view their individual contact information. Depending on your mobile device’s settings, you can either email or call a parent by simply tapping on their contact information (email or phone number as per the data stored in your MIS). Emerge displays Programmes of Study and Assessment Manager Marksheets. You will be able to update this information for students directly from the Mobile app. From each student’s profile, you can view their results for the year so far. 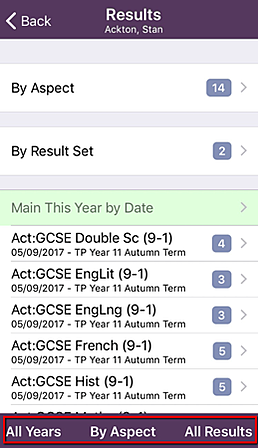 You can also view results from the previous year by tapping All Years from the bottom of the page, then down to view the list of results from the previous year. 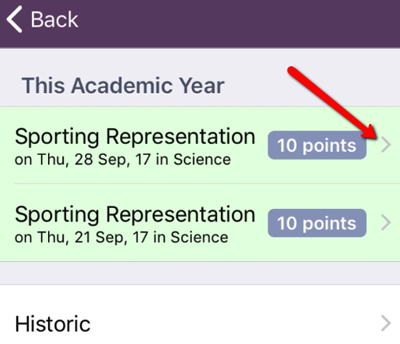 Tapping on Achievements will take you to a list of individual instances where the student has been awarded Achievement points. Tap on any Achievement to view further details. 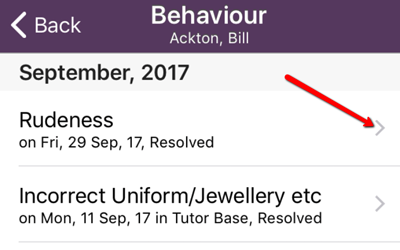 Similar to how Achievements are displayed, tap on each Behaviour incident to view the full details, including the issue, steps taken and who was involved. Top Tip: If you don’t see Achievements or Behaviour under a student’s profile page that means the student has yet to be assigned points. You will only see this tab for students if they have any medical information store in your MIS. This includes any notes (recent or historical) relating to a student’s health. 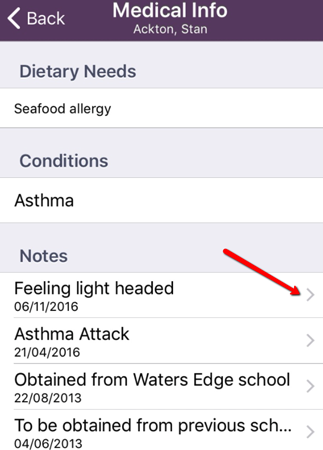 To view medical notes in full, simply tap on the Note you wish to read. This tab will display a student’s class teachers. 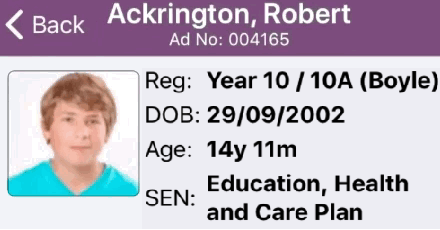 Tap on any teacher to view their contact information, weekly timetable and any their associated groups.